Have you already seen this 1.1 Teraflops Super Computer made by Asus? If not! I will give you some information about this Desktop Super Computer. 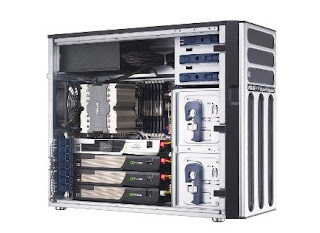 The 1.1 Teraflops Super Computer is powered by 3.33GHz Intel LGA1366 Xeon W3580, and its combined with three Nvidia 960 graphics processing cores in three Tesla c1060 computing processors. This Desktop Super Computer was called: ESC 1000 Ultimate model. Using this combination of cards, the ESC 1000 can reach up to 1.104 teraflops. 'Flops', or floating point operations per second, is a measurement used for processor speed. One teraflop is equivalent to 1012 flops. The world's most powerful supercomputers, including IBM's Roadrunner, run at much higher speeds, are measured in petaflops, or 1015 flops.